We have become specialists at creating bespoke Information Memorandums for your property campaigns. We strive to create design solutions which present effective communcation to your target audience. 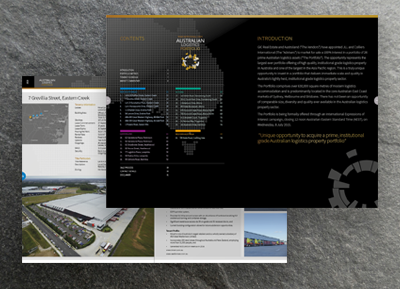 Adscope eBrochures are custom designed to suit your corporate template. We create the content for each campaign and then provide you with a lead-in image to be used in your existing email software. You distribute the email, but we do all the work for you. The result is an eye-catching animated presentation of your campaign. We can create custom designs for your specific requirements including: client presentations; location map designs; aerial mark-ups; html ecomms; illustration... Just let us know what your after and will create it for you. Our goal at Pimento Design is to provide you with the best design solutions for your marketing campaign. Our work is creative, cost effective and completed within your deadline. We understand that the marketing process is part of the overall campaign schedule and sometimes the timeframes are exceptionally tight. We are ready to respond quickly to meet your deadlines. We like to focus on the attention to detail to make sure that your project is of a high quality. We love producing great work and building great relationships with our clients. The Adscope animated e-brochure is a very quick, efficient, and direct sales tool. We start by creating your custom design to comply with your corporate style, including colours fonts and graphics. There is a one off charge to develop the template. The individual e-brochures are created for you and hosted online. Each e-brochure comes with an email lead-in image, which can be easily distributed by you to your clients via your existing email software. The brochures can be updated if details change and re-distributed. 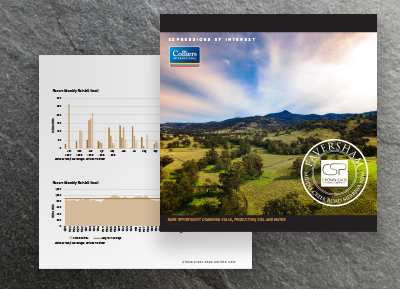 When sold, the brochure can be modified to display a sold banner. It’s just a simple matter of emailing the information through as listed on the checklist below. The turn around time is usually the next day. 28 page Information Memorandum in landscape format. This project highlighted the exceptional location and quality of the subject property. the landscape format was used to highlight the expansive site location. 28 page eBook presentation in square page format. This project was an online flip book presentation for the sale of the subject property. The presentation portrayed expansive imagery of the landscape and also included an embedded video. 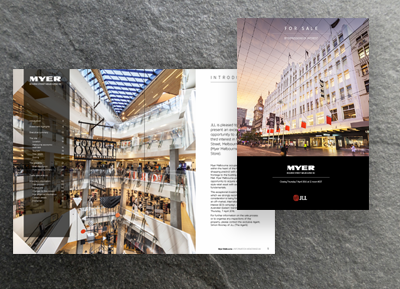 34 page A4 Information Memorandum for the Sale of Myer Melbourne. The design of this project reflected the prestigious quality of the asset. 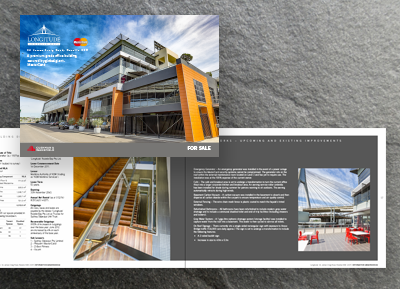 Clean graphic elements with stunning photography combined to produce a high quality result. 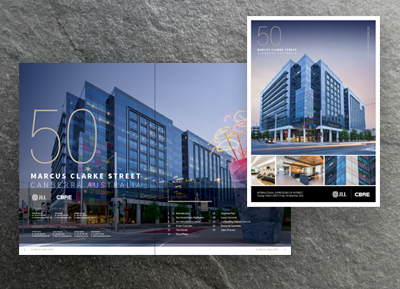 24 page A4 Information Memorandum for the sale of 50 Marcus Clarke Street Canberra. The project highlighted the ultra modern design features of the comtemporary office building. 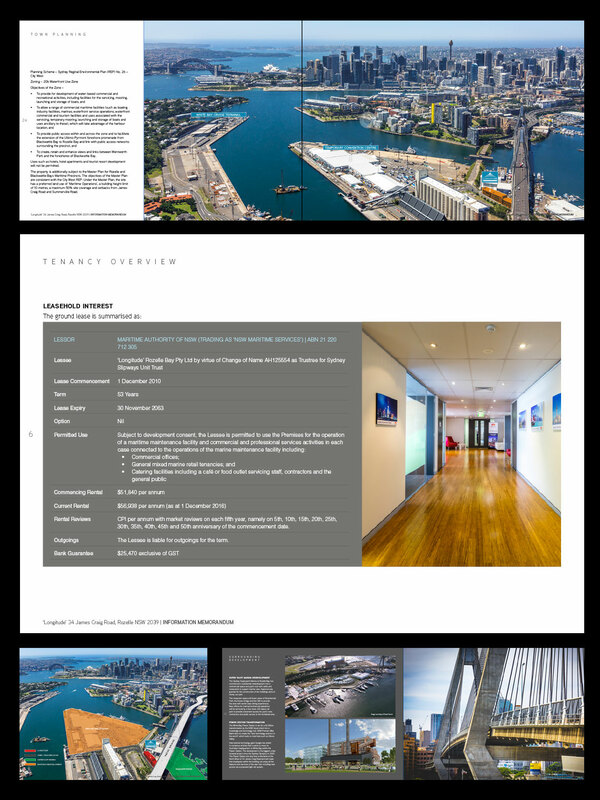 82 page A4 Information Memorandum for the sale of a vast portfolio of industrial assets Australia wide. This large scale project also included a road show presentation, html ecomms and a high quality print run with spot aqueous varnish. 90 page A4 Information Memorandum for the sale of 4 shopping centres. 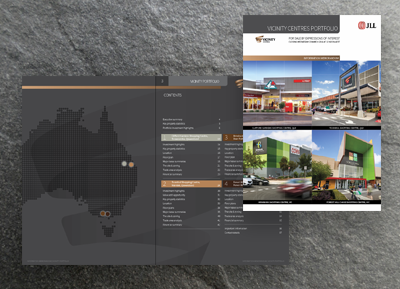 The project included creating aerial mark-ups, floor plans and lease summaries for each of the 4 shooping centres.